Yay! The Pool Shirt is done. 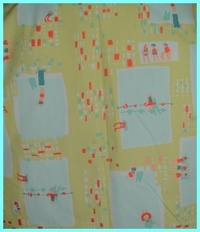 I used the fabulous Munki Munki Pool Party print--so adorable. The pattern was a bit more of a bear than I expected--particularly the collar. Originally, I had a plan to make one for Steve and Ezra too, but now I'm not so sure! 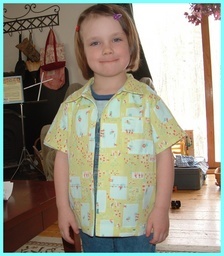 Here's the shirt, almost done (click to enlarge), and a closeup of the cute fabric....I think I'm going to send the shirt off to Nana--the professional seamstress!--to do the buttonholes for me (my machine doesn't seem to like to do buttonholes, and neither do I. Hee Hee).